Libraries in Bangalore have always enticed readers with their inspiring collection of books, periodicals, novels, journals, and various other reading materials. Even in today’s era of e-books and online shopping, the libraries in Bangalore continue to retain their charm and attract scores of readers to explore their formidable literary treasures. Some of the oldest libraries in the city are the most updated ones in terms of quality and variety of literary collections and works. 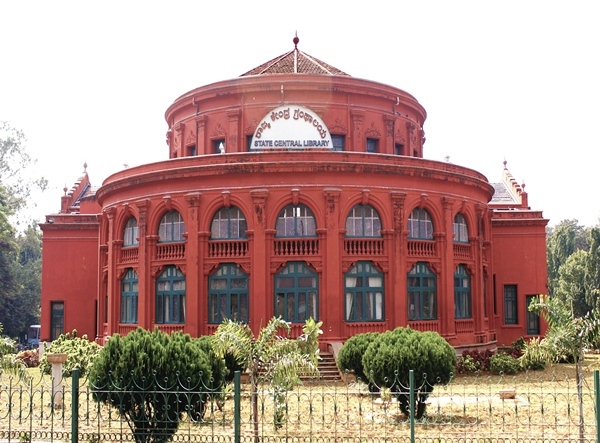 Established in 1915, the State Central Library in Bangalore is a reader’s nirvana. With its magnificent architecture, this imposing building in Pompeian red stands tall amidst the lush greenery of Cubbon Park. Also known as Seshadri Memorial Library, this landmark in Bangalore houses more than 3 lakh books, manuscripts, and journals. It has a remarkable collection of books in different regional languages. The library has a section entirely dedicated to books in Braille. One of the most popular libraries in Bangalore’s south zone is the City Central Library. Inaugurated in 1968, the library has an impressive inventory of more than 50,000 books, including a massive collection of academic material. This makes the library a preferred destination for students preparing for various competitive examinations. With its quiet surroundings and a spacious interior to sit and read the books, the place is frequented by a large number of book lovers every day. Founded in 1945, the Indian Institute of World Culture maintains a general library which caters to the varied tastes of the city’s bibliophiles. The library is categorized into three sections – the main section, the magazine section, and the children section. Among its inventory of more than 40,000 volumes are books in various languages, including English, Kannada, Hindi, Tamil, Sanskrit, Malayalam, German, and French. Some of the rare manuscripts and books found in the library date back to more than 400 years. Eloor Library started functioning in Bangalore in the year 1988. The lending library has an incredible range of books that attracts the city’s bibliophiles. Its large inventory of more than 1.5 lakh books include fictions, classics, biographies, novels, science-fictions, non-fictions, academic books, self-help books, sports books, management journals, cookery books, and books belonging to various other genres. No wonder, the library boasts a long list of loyal members who frequent its premises regularly. British Council Library opens up a world of books, magazines, DVDs, and newspapers for Bangaloreans. The library has an amazing collection of more than 20,000 books. Seated in the spacious study areas of the library, one can access a huge collection of e-books, digital magazines, journals, and newspapers. Its impressive range of academic e-books attracts a large number of students to this library. The century-old Muslim Library is a unique place that preserves great literary works. Established in 1912, the library has a rich collection of more than 30,000 volumes written in Urdu, English, Farsi, and Arabic languages. Among its precious possessions are some rare and significant manuscripts in the Persian and Urdu languages. The shelves of the library also house some important books that are more than 200 years old. The library is often frequented by research students.